Winchester College was founded by the Bishop of Winchester, William of Wykeham, in 1382. It was the first of a new tradition of English Public Schools and was set up with the intention of providing an educated elite who could run the state. According to John Milner, in his History, Civil and Ecclesiastical, and Survey of the Antiquities of Winchester (1809), "a temple of Apollo, the deity of learning stood near the site of the present College". This was set up by the Romans when they were trying to suppress druidry. 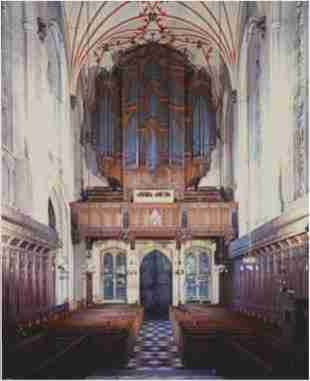 The new organ at Winchester College is housed in the remarkable W D Caröe case, built for a 1908 Norman & Beard organ on the West gallery of the magnificent 14th-century chapel. Seven of the Pedal Organ stops are also inherited from the previous organ but the instrument is otherwise entirely new. The College has a strong choral tradition, and the organ was designed with accompaniment in mind, drawing inspiration from some of the best English organs of the nineteenth century. The comprehensive specification and mechanical action ensures that it is not only a fine recital instrument but also ideally suited as a teaching instrument, being well suited to a wide variety of repertoire. The key and pedal action is mechanical, the trackers, levers and squares being wooden and the rollers aluminium. The drawstop action is electro-pneumatic, the console being equipped with a multi-channel capture system and full complement of aids to registration. The manual departments are arranged vertically, with the Swell at the lowest level beneath the Great, the small enclosed Choir Organ being at the very top of the case from where it speaks clearly out into the chapel. The Pedal is divided on either side in the traditional manner.